Edible Beauty Australia is an Australian company offering luxury skincare products that are so natural you could eat them. Edible Beauty offers wildcrafted beauty teas containing evidence-based therapeutic botanicals to supplement your skincare routine. The skincare and teas are designed to have you glowing from the inside out. 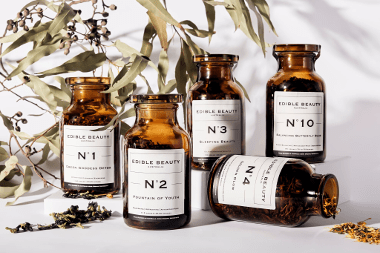 Edible Beauty Australia was born as a result of founder and naturopath Anna Mitsios’ strong belief in the incredible power of herbs and natural foods to transform, nourish and revitalise our lives. Anna’s love of herbal and natural ingredients provided her with a vision to create a luxurious botanical product range including teas and skincare, to promote beauty both inside and out. As a naturopath and nutritionist, Anna is a strong believer of the incredible power of herbs and natural foods to transform, nourish and revitalise our lives. Anna focused on auto-immune disease, children’s health, anxiety and hormonal imbalances in her clinical practice. This background provided a strong impetus for her to spread the awareness of the importance of using natural products to promote vibrance and vitality. Anna is committed to creating products founded on naturopathic philosophies, using exotic natural and certified organic ingredients and encouraging her clients to nourish their skin, from the inside out. Adore Beauty is an official stockist of Edible Beauty. Please note, Edible Beauty tea may not be shipped outside of Australia. Showing 19 products of 19. Finally a rich night cream for oily, acne prone skin! I fell in love this with product from my first use. It has all the perks of a thick, luxurious night cream without the congestion or excess oil. I find it prevents excess oil production and the day after use my tzone is way more matte with just enough oil for that dewy glow. It can sting sometimes which I think might be the clay, but it goes away quickly and surprisingly calms redness and soothes irritation. Great for those with sensitive skin! There are some products out there that really wow you with their first couple uses... then a week later they just seem to stop working and lose that oomph. This product is the complete opposite. I'm on my third jar and still impressed with the results. With regular use my skin has become plumper with a healthy glow and smoother texture, and way less prone to redness, acne and congestion. I alternate this at night with the Pixi Rose Ceramide Cream and after each use my skin is balanced, fresh and glowing. Plus cruelty free and no nasty (damaging) chemicals. The jar has a generous amount of product which lasts me around four months. A little goes a long way and a light spritz of a hydrating mist beforehand makes the mousse glide on like velvet. Definitely worth the price!